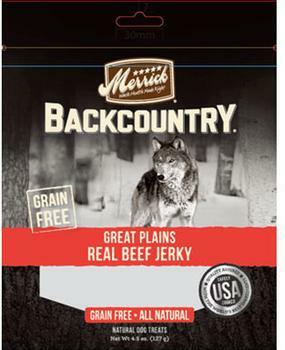 Merrick Pet Care of Amarillo, Texas, is recalling beef dog treats that may contain elevated levels of a naturally-occurring beef thyroid hormone. Dogs consuming high levels of beef thyroid hormone may exhibit increased thirst and urination, weight loss, increased heart rate and restlessness. One consumer complained that dog’s health was temporarily affected while eating the recalled product, but improved after discontinuing consumption of the treat. The production codes are on the lower back of the treat bag. Customers who purchased the recalled products may contact the firm at 800-664-7387 from 8 a.m. to 5 p.m. (CT) Monday through Friday, by email at customerservice@merrickpetcare.com, or online at www.merrickpetcare.com/customerrelations.